People living near the Russian River in Northern California's Sonoma County experienced quite the weather phenomenon last week, in case you missed it: An atmospheric river, as it's called, dumped rain over the area -- and at one point, the sheriff said on Twitter that the town of Guerneville had been surrounded by water, with no way in or out. Just here for the photos? Scroll down. For a quick science lesson on what exactly an atmospheric river is, meteorologist Paul Gross broke it down: "Think about the atmosphere above us as a fluid, and that’s not just something for your imagination -- we meteorologists treat the atmosphere as a fluid in the many complicated mathematical equations that define the dynamics and thermodynamics going on up above. Now let’s narrow our focus to the jet stream, that band of strongest wind aloft, and our main storm track. Think of the jet stream as a river with big curves and bends. When a strong jet stream develops over the Pacific Ocean and targets a part of the West Coast, and the pattern remains stable and doesn’t change much, then storm after storm with copious amounts of evaporated ocean water crash into the coast. This is what we call an atmospheric river. The onshore winds from each storm hit the higher terrain of the West Coast mountain ranges, which forces the wind upward. And since clouds and precipitation result from rising air, you can now envision the intense rain (and snow in the higher elevations) that deluge the West Coast when these atmospheric rivers develop." The Russian River rose to more than 45 feet high in this most recent deluge. As of Thursday and into Friday, waters had started to recede. 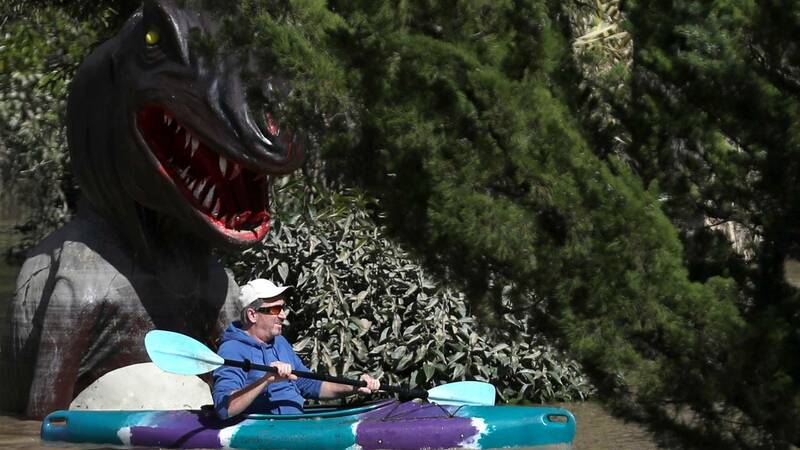 A dinosaur head is visible in a flooded miniature golf course in Guerneville, California. 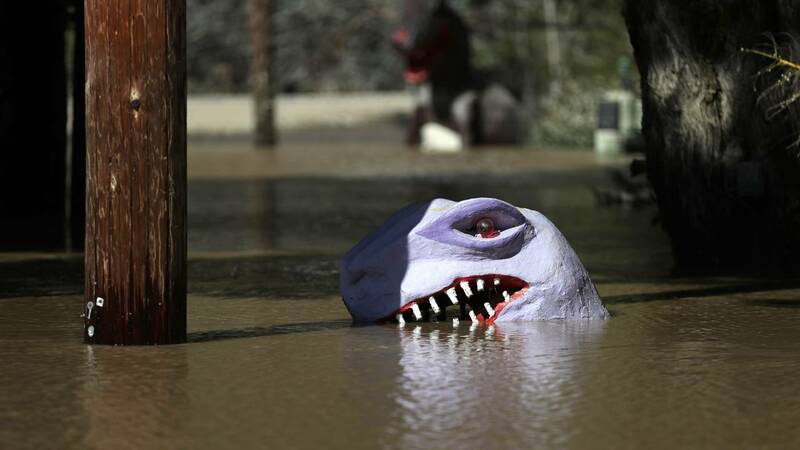 The Russian River crested over flood stage after floodwaters inundated the town (Justin Sullivan/Getty Images). A kayaker paddles through a golf course in a flooded neighborhood. The town was for some time under mandatory evacuation orders after roads leading into the town flooded over (Justin Sullivan/Getty Images). 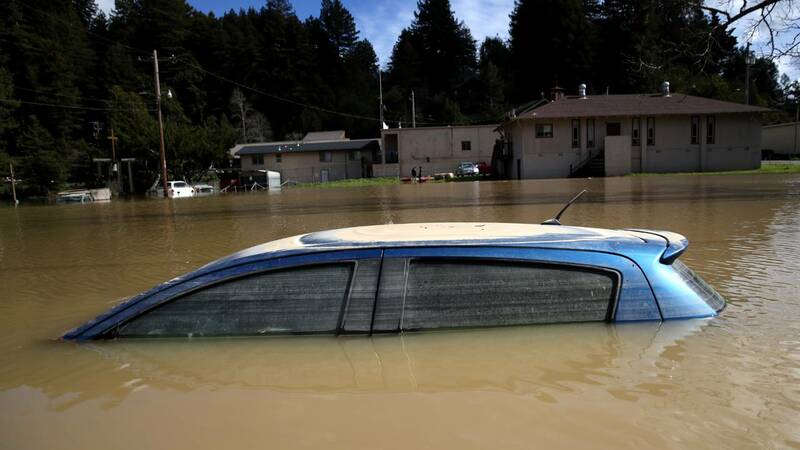 A car sits in floodwaters in Guerneville, California (Justin Sullivan/Getty Images). 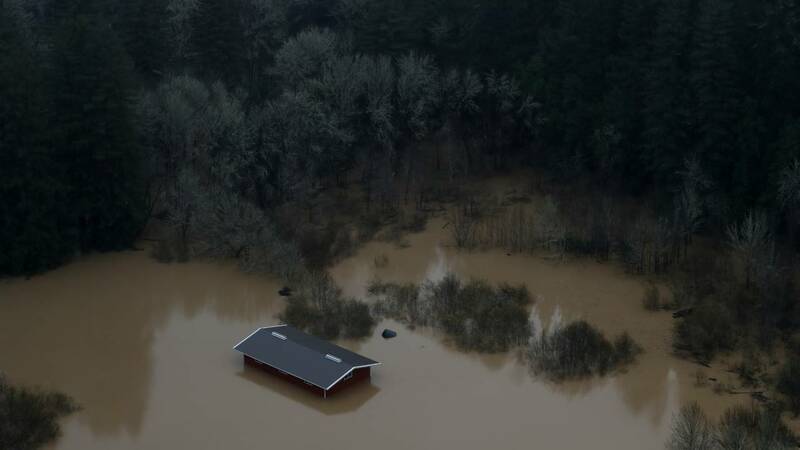 A home is shown in floodwaters from the Russian River (Justin Sullivan/Getty Images). 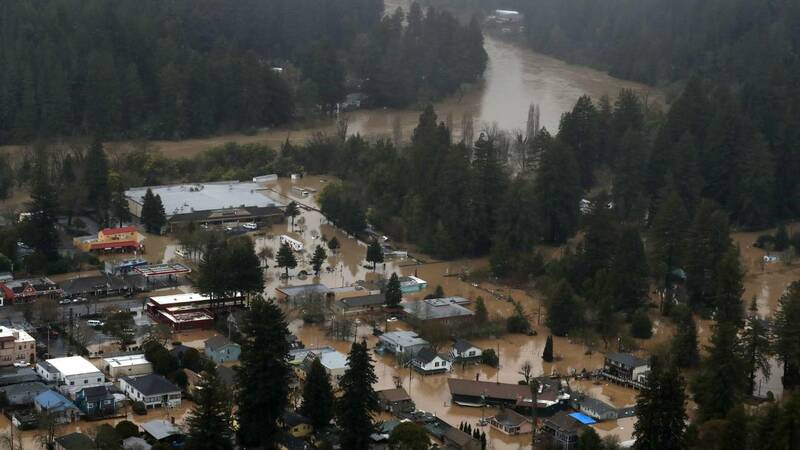 Here’s a view over downtown Guerneville (Justin Sullivan/Getty Images). 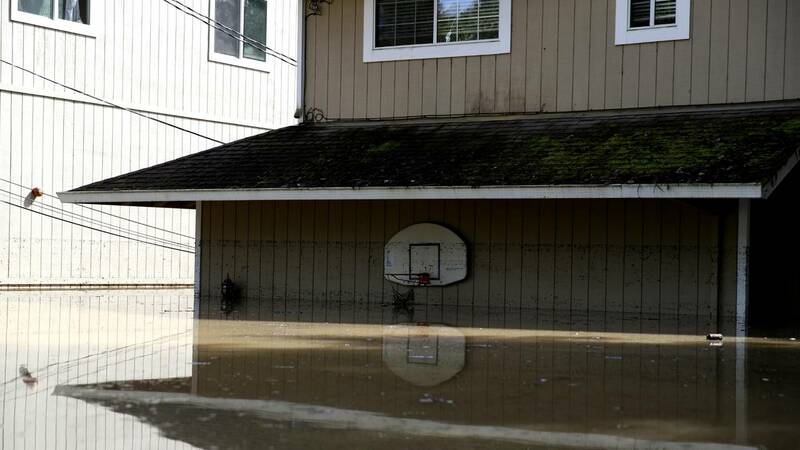 Homes sit in the floodwaters (Justin Sullivan/Getty Images). 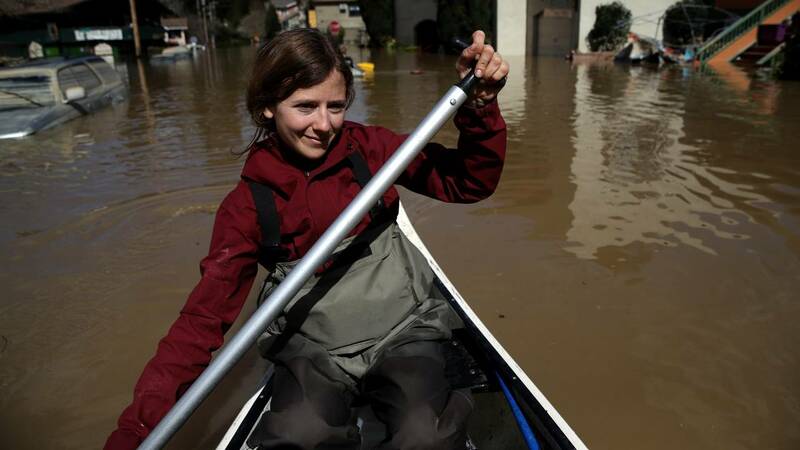 A resident paddles through a flooded neighborhood (Justin Sullivan/Getty Images). 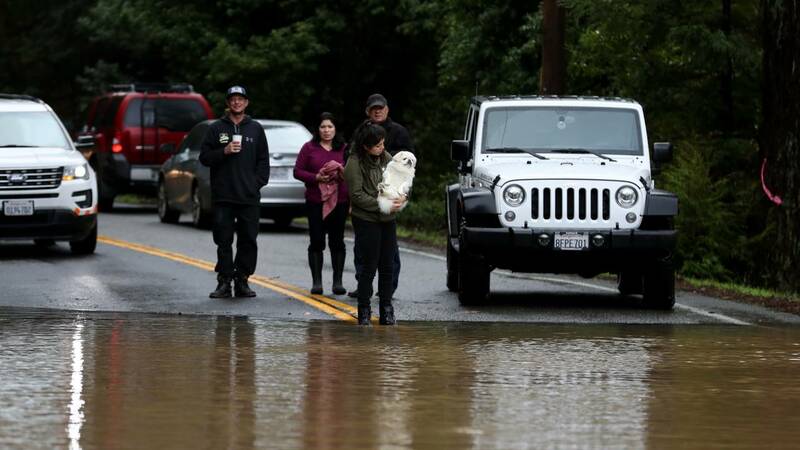 Residents look at a flooded section of Highway 116 (Justin Sullivan/Getty Images). 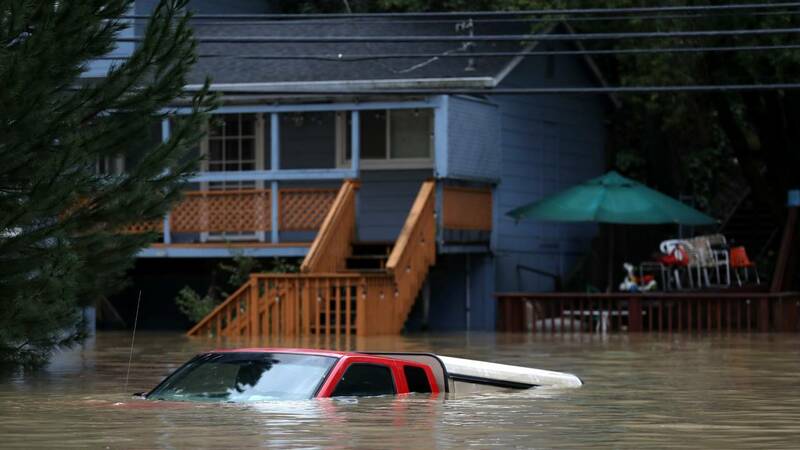 A car sits underwater (Justin Sullivan/Getty Images).